With Chile being as mountainous as it is its not that well connected by rail and a bit of travel by bus or plane might be required to get you to where you need to be. With access to some very unique parts of the world, including Patagonia, the El Morado National Monument and with hills in the city centre in Santiago there really is a vast amount to do in the country; its just finding time to fit it all in. During my week there I only visited Santiago & Temuco in the south but still managed to cram quite a lot in with the days I had spare on my trip. Getting from Santiago airport to the centre of Santiago is simple enough. Two major bus companies run efficient services TurBus & Centropuerto; I can only comment on the latter as this is the one I used. Both buses depart outside the arrivals hall on the far right of the stands. TurBus operates green double deck buses and Centropuerto operates blue single deck buses. 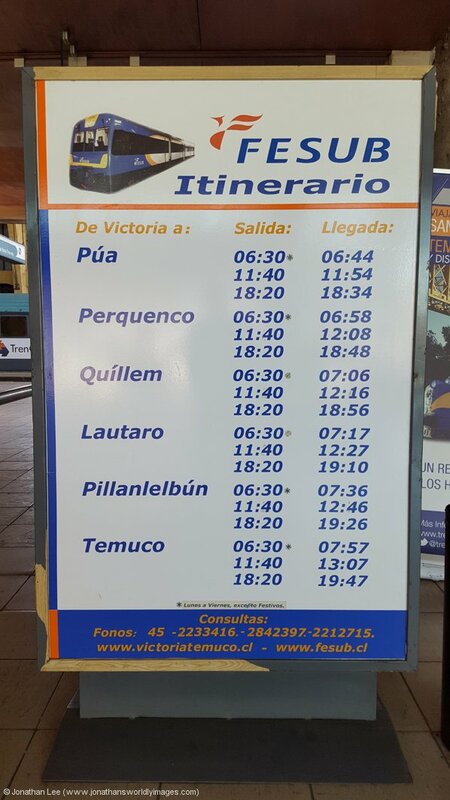 Tickets for Centropuerto can be purchased on-board from the driver and all the relevant prices are displayed as you board. Single tickets cost CLP1,600 and returns (valid for a month) cost CLP2,800. The Centropuerto service stops at most of the Metro stations from Pajaritos to Los Heroes, along the Metro Line 1. A Centropuerto Airport Service Route Map is handy to have. Santiago is easily navigated using the Santiago Metro, the useful Santiago Metro interactive map is very handy; or if you prefer its just as easy to walk round the city instead. I used Ecochile Travel for my day trip out to the El Morado Natural Monument; which is quite a special place with some of the best scenery I’ve ever seen. They offer different tours to various places in Chile and can cater for you personally upon request. Booking tickets for travel within Chile for a foreigner can be a problem and with little English being spoken in most off Chile even calling the railways direct can be an issue; for example I had to get someone who spoke fluent Spanish to book my tickets in advance on the Santiago to Temuco train; and even then the tickets were only blocked from sale and I had to collect and pay for them on arrival in Chile. 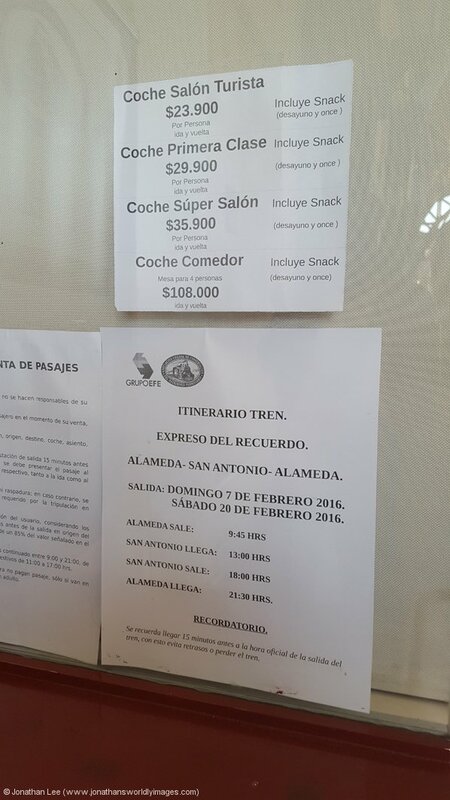 That said I found using the Google translate app to be very helpful when buying train tickets; and for many other things in Chile. All regular operated passenger services are DMU or EMU with only the EFE Santiago – Teumco & Santiago – San Fernando (Tren del Recuerdo) being loco-hauled. Both of the aforementioned feature GE105t Alco powered Shovelnoses. 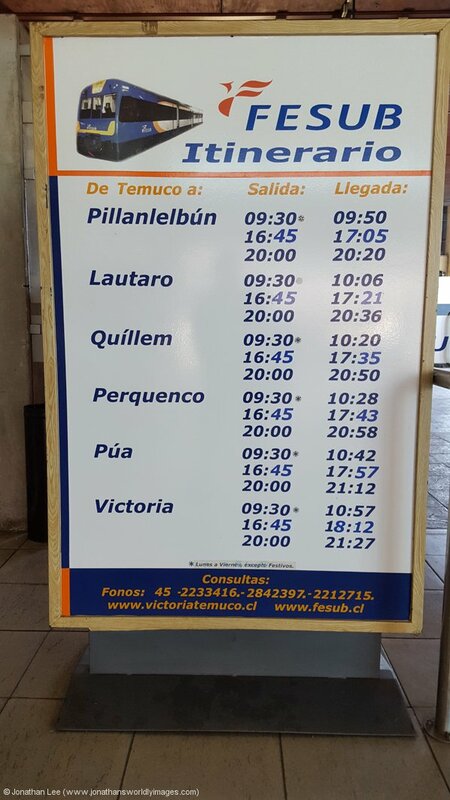 The Temuco train usually features both D16005 & D16012, along with electric E3209, which works as far as Chillan where the overheads are live to. Beyond Chillan, to the south, the overheads aren’t energised anymore! The Tren del Recuerdo used to be worked by a pair of BB6300’s but is now worked by one of the Shovelnoses, usually D16005, and a BB6300 together. There is hopefully going to be a 3rd Shovelnose added to the mix during 2016! FEPASA is the main freight operator nationally and a list of the locomotives they operate can be found at the very good TheDieselShop website. A useful map of FEPASA’s operations is available on their homepage; which at gives a guide to the railway system in Chile. A host of other mining railways exist throughout Chile, which are not listed here, basically as I haven’t researched them.